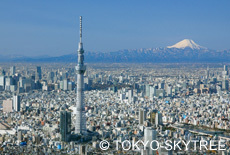 At 634m in height, TOKYO SKYTREE is the tallest architecture in Japan and the world’s tallest free-standing broadcasting tower. Short walk from TOKYO SKYTREE Sta. or Oshiage Sta. 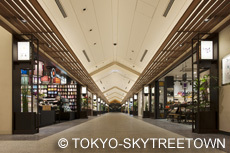 Located at the foot of TOKYO SKYTREE, this commercial complex houses one of the largest number of shops and restaurants in Tokyo. 10:00am-9:00pm (restaurants on 6F, 7F, 30F, 31F: 11:00am-11:00pm) *Hours may vary among shops and restaurants. Closed irregularly.